Happy reading; post your comments here! In slightly less important news, the European Parliament has also voted to 'allow' Britain to keep its imperial measures and abandoned its battle to standardise metric measurements. UK Europe Minister Caroline Flint got straight in there and declared it a “victory for common sense”. We wonder what she'll make of the EP's other momentous decision today? Another victory? Or maybe an admission the European Parliament is shockingly out of touch… who knows. Maybe Caroline will declare there is no "common sense" in preventing workers from adapting their working hours as they see fit. Or maybe she'll just go on drinking the European Parliament's kool-aid. Well, it’s not dead quite yet, it's just that MEPs have beaten it to a pulp. The UK Government could in theory still save it during the so-called ‘conciliation’ stage, but without a veto, that's gonna be difficult. Tomorrow a very important vote takes place in the European Parliament. MEPs are due to take a decision on whether or not Britain keeps its opt-out from the EU's 48-hour working week. It could be immensly embarrasing for the Government. Earlier this year, it ended years of opposition to the Agency Workers Directive - which restricts flexible working arrangments in the UK - apparently in return for retaining the opt-out on working time. But MEPs - in particular Labours' - are now threatening to bulldoze that and vote to end the opt-out. If that happens, then the Government really is in a corner - since the issue will then be voted on in the Council... by a qualified majority. Apart from the obvious and extremely far-reaching impact of the vote on the economy (as we've quantified today) this is also a classic example of how political agreements and backroom 'deals' in the corridors of Brussels are often not worth the paper they're written on. As David Yeandle, Head of Employment Policy at the Engineering Employers Federation, told an Open Europe event last week: “With Europe, you think you’ve won, but then you haven’t". A vote against the retaining of the opt-out tomorrow will send a clear warning to the Irish as they digest the 'political commitments' agreed last week on the Lisbon Treaty: they're not a guarantee - far from it. The Irish Times reports that the conclusions from the Council meeting on the 'Irish situation' have been finalised. The conclusions are meant to give the Irish assurances on retaining a Commissioner, on neutrality, abortion and taxation. The draft conclusions made clear that EU leaders want the Treaty to come into force by January 2010, with a referendum likely to be held in autumn 2009 - after the European elections. Speaking at a press conference in Brussels at lunchtime Taoiseach Brian Cowen said: "On the basis of today's agreement ... I am prepared to go back to the Irish people next year." Nicolas Sarkozy celebrated the fact that “The Irish will be consulted again". Europe's - and Mr Cowen's - impatience with Ireland's voters have revealed a basic misunderstanding of democracy next to which the EU's other problems pale. Europe can and must thrive as a coalition of the willing. That is not what the Lisbon treaty promises to build. A re-run vote on the already rejected Treaty is hardly a surprising outcome. But, equally expected, these 'assurances' are riddled with uncertainties. The exact legal nature of the assurances now needs to be sorted out, which will take us well into 2009. What EU leaders absolutely want to avoid is having to re-ratify the Treaty in each member state, which would need to happen if anything in the Treaty changes. Adding a legally binding protocol to the Lisbon Treaty, for instance, changes the content of the Treaty, effectively making it a new Treaty requiring re-ratification in all 27 member states. At the same time, the Irish obviously cannot be seen as voting again on the exact same text as in June. The solution must lay elsewehere. So how do you change a Treaty without changing the actual Treaty? That is an equation that should not add up, at least according to all known laws of logic. But this is EU politics, remember. "To give a legal value to the engagements made to Ireland by the 26 other member states, we have committed that at the time of the next EU enlargement – whether that will be in 2010 or in 2011, when probably Croatia will join us ... we will use that to add a protocol [on Ireland] to Croatia's accession treaty,"
If this was to happen, the Irish would hold a referendum next year based on future concessions. A key concession is the European Council's unanimous agreement to allow each member state to nominate a commissioner in perpetuity. This concession does not require a change to the Lisbon Treaty, which already provides the European Council with the right to decide the number of commissioners, subject to unanimity. The Council could simply agree on this by means of unanimity - but how such an agreement would be 'legally guaranteed' is unclear. For the other issues, the precise formulation and legal implications of the "guarantees" remain anyone's guess. There is, of course, a general issue with protocols and EU treaties. As the House of Commons EU Scrutiny Committee has pointed out in regards to the UK's proposed protocols on the Lisbon Treaty - they're far from watertight. And unlike the Danes in 1992, the Irish will not get opt-outs per se, but rather 'clarifications' that their laws will not be affected by some presumptive future EU decisions in general policy areas. Tony Barber points out, that there's also a risk for EU leaders here. The move would be perceived - rightly in our minds - as EU leaders trying to sneak changes to the Treaty through the backdoor. There's a possible scenario, of course, that EU leaders in fear of a second No vote in Ireland, will find ways to insert the institutional changes of the Lisbon Treaty into the accession treaty. And let's not forget, in 2010 the Tories could well be in power in the UK with everything that that implies. It's important to keep in mind, adding such protocols to the Croation accession treaty would not be the same changing-the-treaty-without-changing-it solution that the Danes got in 92/93 after their rejection of the Maastricht Treaty. The solution then was the so-called Edinburgh Agreement which laid down the Danish opt-outs in the areas of defense policy, justice and home affairs, the euro and union citizenship. However - bizarrely - this agreement between Denmark and the then 11 other EU member states was not formally a text either of the EU nor of the European Council - as pointed out by Cox in today's Irish Times. The text was actually lodged with the UN in New York and was legally binding by virtue of being international law. It was then essentially codified by protocols in the Nice Treaty a few years later. The Edinburgh Agreement stated that the Danish opt-outs "are compatible with the Treaty and do not call its objectives into question." In other words, it did not change the content of the Maastricht Treaty. A few months ago the Irish reportedly consulted Danish legal experts on such a solution. To a large extent, all of this is academic. The prevailing point is that the Irish are going to be asked to vote again on the entirety of the Lisbon Treaty - with all the loss of power and influence that entails. There is far more in there to object to than any of these 'guarantees' - legal or not - have a hope of covering. Technical and complicated discussion about protocols and declarations and opt-outs is an elite-flavoured distraction from the fact that Cowen, Brown, Sarkozy, Merkel and the rest of them simply will not take no for an answer. Depressing and predictable, but true. Open Europe depicts EU leaders campaigning to "ignore the Irish"
Does Danny the Red need help? Cohn Bendit... losing his mind? A transcript of the meeting between Czech President Vaclav Klaus and senior MEPs at Prague Castle on Friday is reproduced on EUreferendum. The exchange speaks for itself, but Bruno Waterfield correctly diagnoses the "staggering arrogance of MEPs who were, we must remember, guests in the official residence of the Czech head of state." I brought you a flag, which - as we heard - you have everywhere here at the Prague Castle. It is the flag of the European Union, so I will place it here in front of you. Lisbon Treaty: I don't care about your opinions on it. I want to know what you are going to do if the Czech Chamber of Deputies and the Senate approve it. Will you respect the will of the representatives of the people? You will have to sign it. I want you to explain to me what is the level of your friendship with Mr Ganley from Ireland. How can you meet a person whose funding is unclear? You are not supposed to meet him in your function. It is a man whose finances come from problematic sources and he wants to use them to be funding his election campaign into the European Parliament. Saturday's Times had a rather interesting feature on US President elect Barack Obama and specifically his passion for basketball. The article offers a contrast to Britian's political leaders, and rightly notes that "it is hard to imagine Gordon Brown or David Cameron on the sports pitch, even in their youth." Attention is also drawn to the fact that Obama actually manages to "do a high-five on the court and not look as though he was a middle-aged geek trying to be cool." Again, a contrast is drawn to certain British politicans. Slightly more relevant to the general theme of this blog, the article notes that American National Baskeball Association, the NBA, is hoping that Obama's victory will give the league a world-wide boost, including in the UK (where basketball enjoys very limited popularity - to put it mildly). The NBA hopes to set up a European division with teams in London, Barcelona and Berlin. But, the NBA's yearly 'draft' of young players - a set scheme under which the clubs recruit their players, usually from college teams - may violate the EU's employment laws. Although no further details are given in the article, this is said to represent an obstacle to the plans of establishing an NBA franchise in Europe. So, do we here see a future trade row with basketball-loving Obama accusing the EU of enacting non-tariff barriers to prevent American companies (the NBA) to invest in Europe? Hardly. But, as ever, EU regulations work in mysterious ways. 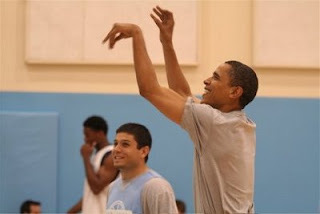 On a seperate note, Obama actually has some decent skills. Open Europe's scouting report shows that he has a good left-hand jump-shot and a nice touch around the basket. However, he seems slightly one-handed (the equivalent of a footballer being one-footed, for those of you not familiar with basketball jargon). Neither does his 'hops' (jumping ability) seem to be what it once was. Still not bad for a 47 year old, also considering that he can 'bench' 200 lbs. In any case, he far outscores most European leaders on athleticism. Sarkozy's jogging rounds are just not quite the same, are they..? The Irish Independent on Sunday carried a comment piece from Dublin Professor Colum Kenny, which criticised Irish politicians who have sought to lay the blame for the failure of the referendum on the Lisbon Treaty at the feet of the media, rather than accept their own failures to engage the public in a dialogue. How refreshing to hear an argument for apportioning blame where it belongs, rather than attempt to scapegoat the media for failing to fall in line with a political agenda. While the European Central Bank was busy cutting interest rates by 75 basis points on Thursday - its biggest move ever - our man in Brussels attended a roundtable discussing ten years living with the euro , with particular focus on the experiences of Spain and Portugal. European Commission economist Carlos Martínez Mongay noted that both Spain and Portugal enjoyed boosts in their GDP before entering the Eurozone in 1999. However Portugal’s substantial growth stopped in 2000, while Spain's continued until last year. He explained this by pointing to the better fiscal policies (budget surpluses) of Spain - in contrast to Portugal where reforms have been lagging behind for years. Also differences in labour market reforms played an important role. 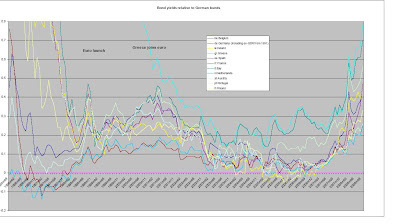 As Mongay showed, after 1999, the Real Effective Exchange Rate of Spain and Portugal was more or less the same. Both countries experienced an increase of around 10%, but the reasons for the increase were much different. In Spain it was stronger productivity. In Portugal, on the other hand, the increase had its roots in the soaring cost of labour, meaning that the more profound labour market reforms in Spain explain discrepencies in the two otherwise rather similar countries. What can we learn from this? Well, the obvious: that eurozone membership is by no means a paneca. A county's growth much depends on structural reforms. Or the lack thereof, such as in the case of Portugal. One can therefore not use the economic growth of Spain as an example of the blessings of the Euro. And one must also look at the disadvantages of sharing a currency and central bank with 15 - soon to be 16 - other countries, some with fundamentally different economic circumstances to one's own. It has been reported, of course, that in Spain and Ireland, the European Central Bank's low interest rates fueled American-style housing bubbles, which now have burst. Spain is currently suffering from a shrinking economy and exponentially rising unemployment. Having your national interest rate set by others is a tricky business indeed. The front page of the IHT this morning informs us that a row over dangerous levels of nickel and lead found in coffee has revealed that the European Commission has doled out a whopping €100,000 on luxury coffee machines for the upper floors of the Berlaymont building - so that top Commission officials don't have to queue with the plebs to get their morning fix. It's often said that EU federalists have a habit of using any crisis as a wake-up call for the perceived need for 'more Europe' (think 9/11, the London and Madrid bombings, war in Georgia). Perhaps it was only a matter of time before this logic was somehow applied even to the Mumbai terror attacks. The last sentence of the following quote says everything about this mentality. According to El Pais, Spanish MEP Ignasi Guardans, returning from Mumbai yesterday, lamented the “lack of coordination” of the EU during the terror attacks in the city. 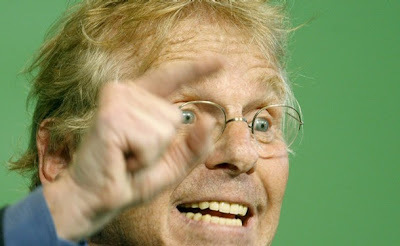 He added, “There has to be a profound revision of Europe’s role in crisis situations. There are moments when Europe should prove it exists”. This useful website (which is unfortunately on the verge of shutting down) keeps track of the voting behaviour of the Members of the European Parliament. They can be ranked on several issues. One is the loyalty they show to their political group, found here. It shows that around 75% of MEPs vote with their group at least 90% of the time. Another ranking, to be found here, shows the rate of attendance. 173 MEPs don’t manage to be there 75 percent of the time. 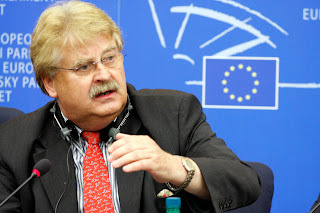 Thanks to Bruno Waterfield's Telegraph blog we learn that “Brussels spin doctors are planning to put a ballot box into orbit” in an attempt to raise the profile of next June’s European elections. The stunt forms part of a £21million PR contract to come up with a "campaign concept and visual identity" for the European Parliament. Hmm. We can't quite see how this is going to improve the EP's image, but blasting the ballot box into outer space certainly seems an appropriate symbol of the giant abyss between voters and the EU, no? British MEP Glenis Willmott paints a very worrying picture of the European Parliament's attitude to democracy in the Parliament Magazine. She accuses the EP authorities of undermining MEPs' efforts to promote a debate on the £200m monthly jaunt to Strasbourg. "[Last month], a poster promoting the written declaration was removed by parliament’s authorities under the pretence that MEPs ‘should avoid activities on parliament’s premises which might be regarded as controversial’. I find this wholly ridiculous. Most dictionaries define controversial as ‘causing disagreement or discussion’. Should a modern parliament such as ours really be seeking to restrict disagreement or discussion? Yet unless I have grossly misunderstood the situation surrounding the removal of the poster, that is precisely what has happened." Finnish MEP and former prime minister Anneli Jäätteenmäki is tackling the EU Commission over a proposal to make the EU's transparency problem even worse. Current rules state that any “content…concerning a matter relating to the policies, activities and decisions falling within the institution’s sphere of responsibility” is open to the possibility of public scrutiny. But the new rules would mean that only the final, transmitted version of documents will be listed on the public register, which, Jäätteenmäki says, "will encourage policymakers to share information informally so that it will not be subject to public scrutiny." According to the FT, China has just "raised the price of its cooperation in the world's climate change talks" by demanding that developed countries spend 1% of GDP on transfer funds to poorer nations to help them reduce emissions. For the EU, this would equate to $160bn, and for the US, $130bn. The Chinese conceded that even such large funds "might not be enough". China has done more than just raise the price for its cooperation - unless this is some kind of ruse, it has thrown a spanner in the works of climate change diplomacy. It is supremely unlikely that the US or Europe would be at all in the mood right now to pledge such enormous sums. Some transfers will occur through the continuation of the Clean Development Mechanism (CDM) - which allows western governemnts and companies to offset their emissions by buying in permits for apparently 'green' projects in developing countries. But leaving aside the fact that these projects are usually useless or harmful, CDM transfers won't put much of a dent in the amount the Chinese are asking for. 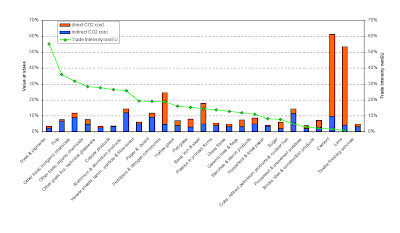 If we go with the Commission's estimate that between 2013 and 2020 EU industries in the Emissions Trading Scheme will be allowed to offset around a third of their reduction commmitments through the CDM, this would mean 100-150 million tonnes worth of 'reductions' could be 'imported' in this manner. Even assuming a relatively high CDM price of $25 per tonne, this would only equate to transfers of just under $4bn. Even if ALL of the reduction commitment under the ETS was to be met through offset credits (which will probably actually happen in the current trading phase), this would imply transfers of about $10bn. There'll be some demand from the non-ETS sectors and national governments, but that won't raise the transfers by more than a few billion dollars worth of permits. It's a long way off $160bn. In short, what the Chinese are asking for goes way, way beyond the existing mechanisms for transferring (pretty substantial) funds to developing countries to fight climate change. The amount of money being requested is ludicrous and unrealistic and will probably be scaled down, but the principle of asking for large financial transfers is likely to be maintained during negotiations. India has been less brazen, but will probably row in behind the Chinese on this. As Prof. Dieter Helm (who advises the UK government on energy matters) has pointed out, the rest of the world doesn't regard the EU 20-20 by 2020 targets as realistic or credible (and neither it seems do many EU member states). The EU position is mere “political rhetoric” he says. Bearing in mind this lack of seriousness/ realism on the part of the EU, it's not hard to see why the Chinese want to secure huge sums of cash as a kind of insurance policy before making any binding pledge on carbon reductions. Second referendum in Ireland - would a general election help the 'Yes' side? An interesting piece from Hugo Brady at the Centre for European Reform, a close observer of Irish politics. He believes that an election in Ireland next year could help clear the decks for a second referendum. "Though the Nice treaty issue was not prominent in the campaign, the change of government wiped the political slate clean and provided some legitimacy for the previous decision to be re-visited. The chances of this happening in the case of the Lisbon treaty have suddenly increased. If the present government falls, there will be three options. There may be a general election. Or Fianna Fáil may form a new coalition with new partners. More probable is the formation of an alternative government, led by the largest opposition party, Fine Gael, backed up by the Irish Labour party and others." He argues that a series of guarantees on abortion, neutrality, tax etc should be consolidated into a single protocol on ‘Ireland in Europe’ to make them more visible to the public. Being able to focus attention on a single document, rather than the unintelligible mass of legalese of the Lisbon Treaty, would certainly make life easier for the Irish government in a re-vote. Although Brady thinks that other EU member states would be reluctant to make concessions on letting Ireland keep its Commissioner, we're less sure. There would probably be another fake EU row, allowing the Irish government to return home from negotiations claiming 'victory' against apparently staunch opposition from the large member states. This would certainly strengthen their case in any referendum. Such a scenario could align neatly with the plan (already mooted in Dublin) that a 'legal solution' could be used to the push most of the Treaty through parliament, with a 'limited referendum' on those parts of the Treaty that do require a popular vote under the Irish case law (possibly just the Charter of Fundamental Rights, foreign policy and defence). Again, this would make it easier for the Irish Government to focus its campaign on the newly 'won' protocol on 'Ireland in Europe', which could deal with many of these issues. The Irish government will therefore be keen to present the Treaty as new and the changes (whether material or presentational) as hard won - a change of government, followed by negotiations in the EU and an easy to read protocol could help achieve this. Still, as we've argued before, the biggest problem for them is that the Irish people have been watching politicians scheming in public ever since the no vote, and are well aware that a con is underway. The shape which this con will take is gradually becoming clearer. Under the rules of the EU's grandly named 3rd Anti-Money Laundering and Counter Financing of Terrorism Directive (directive 2005/60/EC), the UK's Financial Services Authority is now obliged to examine the personal details of those connected to religious and charitable organisations on the pretext that they may be plotting terrorist activities, and has sent a demand for the information, warning that "non-compliance of regulatory obligations" would be "serious". Meanwhile, EU bosses have offered €11bn in aid to the Bulgarian government - despite widespread reports of corruption and money laundering in the country, and despite Bulgaria's failure to identify the source of crime when it joined the EU last year. Criminal gangs are now so rife that the Bulgarian MP Atanas Atanasov, a former counter-intelligence chief, has commentedL "Other countries have the mafia. In Bulgaria, the mafia has the country." Are bond traders pricing in an EMU break-up? Tony Barber on the FT's Brussels blog urges readers to "watch the yield spread" when it comes to the debt of eurozone governments. "[widening bond yield spreads] hint at a degree of uncertainty among investors about the cohesion of the 15-nation eurozone itself - namely, whether Greece and Italy are economically strong and fiscally disciplined enough to share the same currency with Germany over the long term. This would not be an issue, of course, if the eurozone were like the US and had a central fiscal authority to transfer revenues between flourishing states and states suffering an economic shock. But you cannot have a central fiscal authority without a much greater shift in the direction of European political union than most politicians, taxpayers and voters appear ready to contemplate." One comment on Barber's blog complains that his argument is focussing too closely on a recent timeframe, citing an enornous yield spread in the mid-90s. But although the yield spread between Italy and Germany by today's standards may have been extremely big at that time, it is also hugely significant what happened to spreads after the launch of the euro. A Warsaw-Beijing pact on climate change? 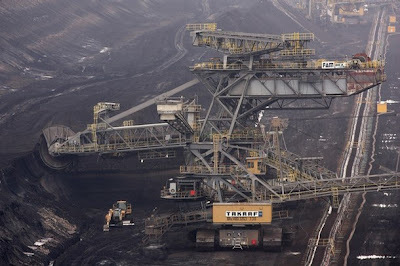 According to Reuters, the Poles are calling in some heavyweight support in their bid to outflank the EU on tough new conditions for coal burning industries. "I expect that in China we will find an ally for the global climate talks. We are in a similar situation due to our coal-based economies. We cannot allow fighting climate change to destroy them." Any global deal on climate change will be close to useless without Chinese backing, meaning Poland's position would be considerably strengthened by any alliance with Beijing on this issue. This follows earlier endorsement for Warsaw from fellow ex-communist EU members and a big western European power in Italy. As we argued before, the potential for European consensus on climate change policy has undoubtedly been damaged by the overly interventionist and centralised approach adopted by the Commission. This bodes ill for any EU agreement by the end of the year, and more importantly, any global deal. The 5 largest European countries are unanimous in their desire to see Barack Obama elected whilst John McCain's rating is extremely low. If they could vote, only 1% of French, 5% of German and 8% of Spanish respondents would elect John McCain. In the United States, the Republican candidate is behind by 10 points. Whilst Europeans declare themselves to be fascinated by this election, nearly one in two British respondents (47%) say that they are not at all interested in the vote. Conversely, Germans are the most enthusiastic Europeans with 85% of those interviewed interested in the election. Will EU climate policy cripple German business? German Environment Minister Matthias Machnig and chambers of commerce boss Martin Wansleben have an interesting exchange which highlights the sharp divisions opening up towards the EU climate change plans in Europe's biggest emitter and industrial powerhouse. Both the heavy industry and green lobbies in Germany are powerful, and the outcome of their rivalry will have a decisive effect on negotiations over the EU's climate package, with profound implications for the rest of Europe. Machnig: We want emissions certificates in the energy sector to be auctioned 100%. Wansleben: That’s fatal! It will lead to higher electricity costs for everyone. Business and consumers will never accept that.. It is inefficient and too expensive for Germany as a business location… We must set in motion policy that also incorporates large-scale emitters such as the USA, India and China. M: Of course we want a global emissions trading system..the industrial countries will have to take the first steps. Our industry will have the advantage of becoming more competitive. W: You’re mistaken. Many companies here in Germany will not survive that. "When the legislation was considered, the Commons committee warned about the inclusion of racism and xenophobia in the list of offences where it was unnecessary to prove it was against the host and issuing country's law, precisely because of differences in interpretation from one EU country to another." Unfortunately, it seems the often very sensible recommendations of the experts in the EU Scrutiny Committee are overlooked far too often. The repeated warnings about the weaknesses, among other things, of the UK's so-called 'safeguards' on the Lisbon Treaty spring to mind. I wonder if Chris Huhne and his colleagues will one day be lamenting the failure to heed that advice, too. This is from an interview with former '68 student revolutionary leader and MEP Daniel Cohn-Bendit. Q: If you were in Angela Merkel's shoes, how would you respond to German industries that are seeking to put the brakes on the adoption of ambitious objectives? A: I would tell them: "Listen, too much is too much. We have been telling you for fifteen years now that you have to reduce the CO2 emissions of cars and you still haven't done so. Now you will do it, because regulation will oblige you to do so." Talk to us about Libertas, the group that was arguably the most vocal and high-profile anti-Lisbon force in the Irish referendum. Questions are emerging not just in Ireland but throughout the EU as to where this group received their substantial funding. What is your opinion? I can't comment on where they're receiving their funding, but I can say this: I would say to you, based on my own involvement here in the European Parliament, that the pro-NATO lobby* is not happy with the idea of Europe becoming involved in peacekeeping operations. I had clear evidence of that, for instance when EU troops were assigned to Chad, and I would certainly not be surprised by the arms trade in America becoming involved in trying to destabilise the development of a common European defence. The idea of arms trade lobbyists funding 1.2 million euro towards ensuring a 'no' to Lisbon in Ireland is certainly not beyond the bounds of possibility. As with many conspiracy theories, this one is clearly irrational and contradictory on a number of counts. The US Government has consistently supported the Lisbon Treaty and its predecessor, the EU Constitution. And why would shadowy arms trade lobbyists oppose greater European spending on defence, and a more activist role for European armed forces (an argument the UK has made to support the Treaty)? But rationality or pursuit of the truth was never behind speculation of the links between Libertas and the Pentagon: these rumours are designed to discredit and smear opponents of the Treaty in the run up to a second referendum. When the Irish are made to vote again, the stakes will be extremely high, and supporters of the treaty are prepared to fight dirty. As we reported previously, the Commission has already hired a firm of American 'PR hitmen' to set up a "crisis communications" unit to promote the EU - these are not the sort of people who are hired by their clients for friendly, softly-softly publicity. The second Lisbon referendum campaign has already started, and this steady drip of unsubstantiated rumour and speculation over the No campaign's funding is only the beginning. *On a different note, it is interesting to hear Burke refer to tensions in Brussels between the "pro-NATO lobby" and those who want to see a greater role for the EU in defence/ peacekeeping. If this is true, it goes against the UK Government's line that the Lisbon Treaty is designed to complement and reenforce, but not challenge NATO. According to Point Carbon, carbon prices for permits traded within the EU Emissions Trading Scheme (EUAs) have "crashed", and are now priced at less than €20/tonne. The chart below illustrates how far the price has come down over the course of just one month. We have made the point repeatedly that price volatility is a major flaw in carbon markets, and acts as a serious disincentive to large-scale capital investments designed to cut carbon emissions. Decisions on this scale of investment take place over a timeframe of years, possibly decades, making it very difficult for big polluters to make plans on the basis of an erratic carbon price signal. Carbon prices are driven by scarcity in carbon permits, which in turn is determined by a number of complex and unpredictable factors - including weather patterns, fossil fuel prices and expected economic growth. The latter two factors in particular are behind the current slump in prices in Europe. This illustrates the intrinsic problem of the ETS and systems like it: bureaucrats cannot predict the future, and can never have the knowledge or resources to be able to set the allocation of carbon permits at the "right" level for a five or seven year trading period. When things don't go the way the officials expected, the result is volatility in the price of carbon. That's why we think it's time for emissions trading to be replaced with a solid, long-term carbon price mechanism such as a tax. An FCO press release this morning confirms our new Europe Minister Caroline Flint intends to carry on in a long line of politicians telling us we should accept the EU institutions and all their problems because... we have European friends, take European holidays and eat European food. "Britain is an island nation, but our instinct is international - we shop at European fashion shops, we eat at pizzerias, we holiday on the Mediterranean. So why do people distrust the European Union and feel distant from its institutions?" "If the EU didn't exist, in the last few weeks we would have wanted to create it."